We’re kicking off a new feature today, Author Chat. Nick Trout, author of New York Times bestseller Tell Me Where It Hurts is going to be on LibraryThing for the next few weeks (from today, April 14th through April 30th). He’ll be talking about the book, and his work, and answering questions from you, the readers. Start coming up with questions! If you were one of the lucky 24 to receive a free copy of the book in last month’s batch of Early Reviewer books, then you’ve got a head start! If you didn’t get a free copy, then don’t fret. The book is out in bookstores and libraries, so go buy or borrow a copy now, and get reading. Join the discussion in the Author Chat group. The direct link to the Nick Trout thread is here. 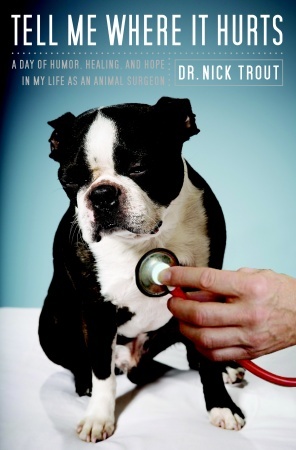 Nick Trout is a staff surgeon at the Angell Animal Medical Center and lives near Boston, Massachusetts. For more on the book, check out this YouTube video, or even read an excerpt on the Broadway Books website.